The second Chris leaves on a business trip, that's when the major (crafts) projects come out. 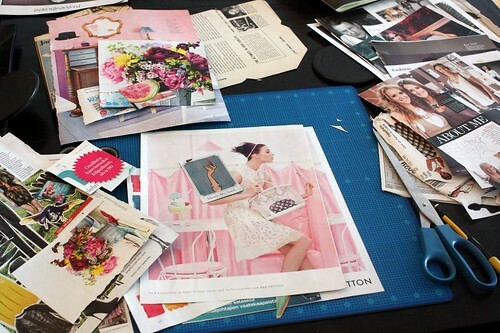 Right now the entire dining room table is covered in paper scraps. I have torn apart some magazines and kept the pictures that inspire me by topic, arrangements or sometimes just by their colors. As you can see, the snippets are in rough piles by colors and I started working on the pink and retro blue ones. I'm trying out a few different things with these papers. I'm working on some collages (still) as well as working on some color combinations. I find this is the easiest with magazine clippings. Since the 'what to do with old magazines' post is super popular, I'm thinking about doing a follow up with some newer projects. Besides all the color coordinated paper, the cats are bonkers. 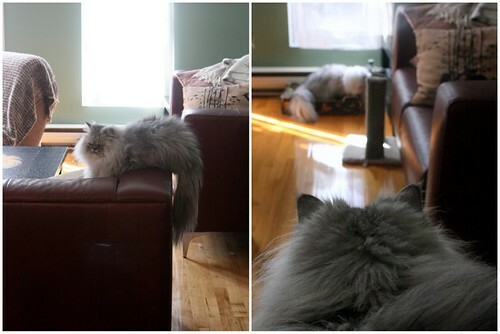 They are stalking each other and running around like crazy. Until they just flop over where they stand and go blissfully to sleep, like nothing ever happened. Sounds like a pretty awesome life. George is still not at 100% health, but if he has the energy to go nuts, then he's doing much, much better. P.S. Oh, look what I found yesterday! 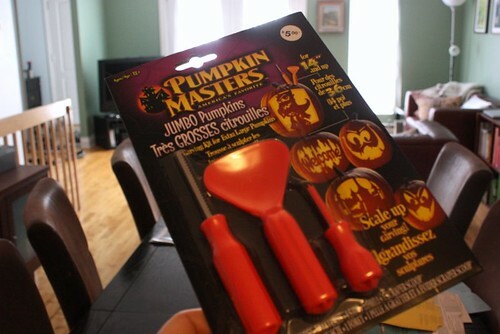 Pumpkin carving kit! I insist carving one every year. Do you carve pumpkins?